Steve Silberman's NeuroTribes is a large, densely packed book about autism's past, present, and future. I found myself overwhelmed by the amount of information contained in each individual paragraph, in considering how much research and synthesis it took to create those paragraphs -- and in knowing that NeuroTribes's information matters so much, while acknowledging my kind of brain can't possibly retain it all. It doesn't surprise me, then, when other people have trouble remembering every important point in NeuroTribes, because the book is an 500-page information tsunami. Due to those info overload risks, however, some of NeuroTribes's themes need to be repeated more than once or twice for people to get them right. 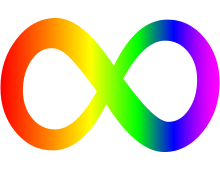 One theme that needs more emphasis is NeuroTribes' clarification about neurodiversity: The term is not limited to autistic people who communicate independently, or indeed only to autistic people. Neurodiversity is the full range of human neurological experiences. That means you, your loved ones, and every other person on this planet is included in neurodiversity. And that means the term 'neurodiversity' is not only not a synonym for Asperger's syndrome, it is also not a synonym for all diagnosis-worthy brain wirings, be they bipolar, ADHD, dyslexia, clinical depression, OCD -- or, you know, autism. It follows that the opposite of neurodivergent, which is 'neurotypical' or 'NT', also includes more than non-autistic people -- even though NT is sometimes used as shorthand by authors with definitive writings on neurodiversity. "People with dyslexia, ADHD, dyscalculia, and myriad other conditions (christened 'Cousins' in the early days of ANI [Autism Network International]) were also welcome to join the list.